Although Seaton Church does not has the profusion of things to see but what there is are interesting. 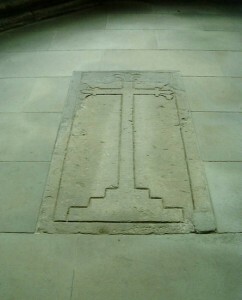 This graveslab shows displays some powerful Christian symbolism. The Fleur de lis is a stylised lily and the three prongs signify the Holy Trinity. As these are place on the arms and hear of the cross the symbol is trebled in power 3 x 3.